Remote Managed IT Ann Arbor professionals access your computer to resolve your problem. But is remote access safe? Most people who own computers have granted remote access to a computer technician at one point or another. However, watching someone take over your computer and begin accessing files and system configurations can be a disconcerting experience. After all, we store a lot of sensitive information on our computers, and allowing access to those files or our system controls could be a security compromise. However, remote access is also necessary for IT technicians to provide timely support, conduct routine updates, and reduce the cost of location visits. Furthermore, while it may seem like a security breach to grant remote control over your systems, it’s actually no less secure than allowing someone to log-on in person. That said, there are precautions you should follow to ensure the security of your business and to safeguard the sensitive information of your clients. It involves carefully vetting the businesses who have access to your information, as well as being aware of the warning signs of a possible scam. Here’s what to watch out for. Never allow access to someone who contacts you first. There are, unfortunately, many remote access scams. They usually follow a similar formula: the scammer calls a user, claiming to be from a large IT-related corporation, such as Microsoft. Then they make one of several claims: they are receiving error messages from your computer, or they have detected a virus, or your broadband connection is insecure. They use this as a pretense to convince you to let them access your computer. Once you have done so, they are free to run a virus or install malware on your computer. The main warning sign here is simple: no one should be calling you and asking for this level of access to your computer without a prior relationship. It would be analogous to a car mechanic from a service station you’ve never visited calling you on the phone to say that your check engine light is on and that you need to bring your vehicle in for repairs. In other words, no one you haven’t contacted should know what’s happening on your computer. And, even if you have been sending error messages to Microsoft, these are usually the result of system-wide problems. Microsoft’s solution would be to release a patch to all users that you would then download as part of your regular system updates. They certainly wouldn’t begin contacting individual users. Run regular system backups, just in case. Avoiding computer scams is one thing, but what about when you need to find a technician yourself? Many businesses—particularly small ones—don’t have an in-house Managed IT Novi MI person to turn to when things go wrong. And if they haven’t already established a professional relationship with a technician they trust, they may have to find someone at the last minute. If you find yourself in the position where you have to allow remote control of your computer to an outside party, make sure you run regular system backups as an insurance policy in case anything goes wrong. The technician may not intend to do harm, but an inexperienced person could create more issues, even as they solve the instigating problem. Even when facing an emergency, you want to be sure the person you contact is a qualified and reputable technician. An established business can provide a stronger guarantee of good service than an independent contractor, and may also be able to provide a fuller service package. Granting remote control of your computer or any other part of your network is a matter of trust, especially when you don’t entirely understand what the technician is doing. Because of this, your best protection it to be proactive in searching for reputable IT professionals and establishing trust before you’re facing a crisis. A qualified business will have a record of good service with other businesses in the area. They will explain their policies and services beforehand, and they should share your concerns about security. Depending on your industry, your IT service provider may even have compliance expertise that can help you bolster your systems against potential threats. And yes, their services probably will include remote access. This is an essential feature they need to monitor your network for potential breaches, conduct routine updates, and identify areas of slow performance. 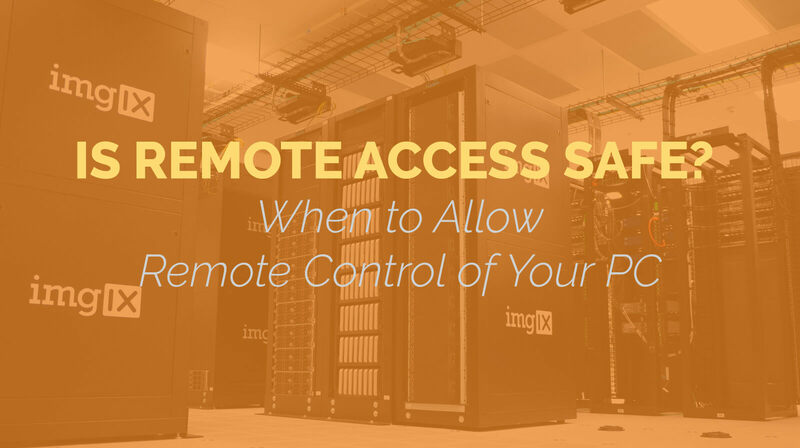 Allowing a remote technician access to your PC is no worse than allowing anyone else access. The primary reason control feels so uncomfortable for users is because we can’t see the person on the other end. Even if we can watch what they do on our computers and talk to them on the phone while they do it, watching a cursor move around the screen and open files without any action on our end feels almost ghostly. That said, allowing remote access to a technician poses the same risk level as dropping your PC off at a repair store, or letting them log on to your system in person. Either way, it all comes down to how much you trust the person doing the repairs. While this isn’t always easy, if you’ve ever hired someone to come by to conduct a home repair, or left your car with a mechanic, then you already know what it means to trust someone with access to your home or vehicle. Remote access is just the same, with the caveat that you can often watch the updates while they’re happening. Find an IT business you trust to help you with your maintenance, and allowing them remote access won’t just be safe, it will also be convenient, proactive, and more affordable than the alternative. Click here to learn more about our Managed IT Services.